Many people are unhappy with the appearance of their arms, particularly the area at the top which is sometimes unpleasantly referred to as “bingo wings”. This can sometimes appear even worse following significant weight loss, when lose skin is left behind. For some people, the skin left behind can overshadow the achievement of losing the weight in the first place. Once skin has been stretched following weight gain, sometimes it does not shrink back to its normal size following weight loss, leaving folds of skin where there was once fat. This is where an arm lift may be helpful. 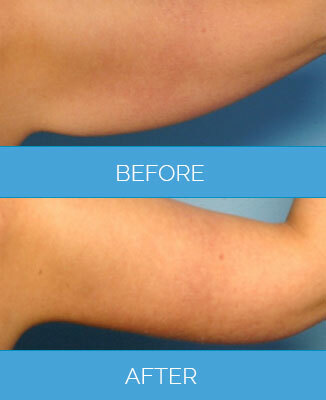 An arm lift is a surgical procedure to remove excess skin, leaving the area taught and smooth. The procedure is performed under general anaesthetic by a specialist cosmetic surgeon at one of the luxury private hospitals we refer you to. During the procedure, the surgeon will remove the excess skin carefully and pull up the remaining skin, giving the lift. The skin is then carefully stitched. The surgeon will be carefully to minimize scarring and make any incisions as inconspicuous as possible. Most of the time, clients will stay overnight for observation, being able to return home the next day. As with any surgery, there is the small risk of complications with arm lift surgery. At the time of your consultation, the expert we refer you to will take you through the risks in detail so that you can take an informed decision. The results of an arm lift are permanent, however if you gain weight following the procedure, your arms may increase in size. There are no patient stories for Arm Lift. Any form of cosmetic enhancement is very personal, so prices are bespoke dependent on your individual needs. As a rough guide, you can expect to pay £3990 – £7500.